Flying Falcon Decoy Bird Scarer is a life like, fake bird for scaring off nuisance birds. 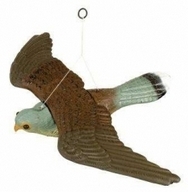 The Falcon is a predator bird [ naturally preys on other birds ] and so this plastic decoy will frighten off problem birds. Can be hung in trees, on the balcony, on sailing boats or in other areas where you need to scare away, repel, deter and stop pest birds.